Some people think that love is a luxury which requires a lot of effort. Some people think that love is a necessity which comes easily. Everyone has varying levels of ambitiousness when they’re looking for love. But what if, during an uncertain time in your life, you come across someone? Would you pursue it or would you give up? To answer this question, we conducted a survey of over 2,000 users. The survey found that 74.3% of men and 62.1% of women would take the initiative to develop a relationship during a time in which their life was unstable. 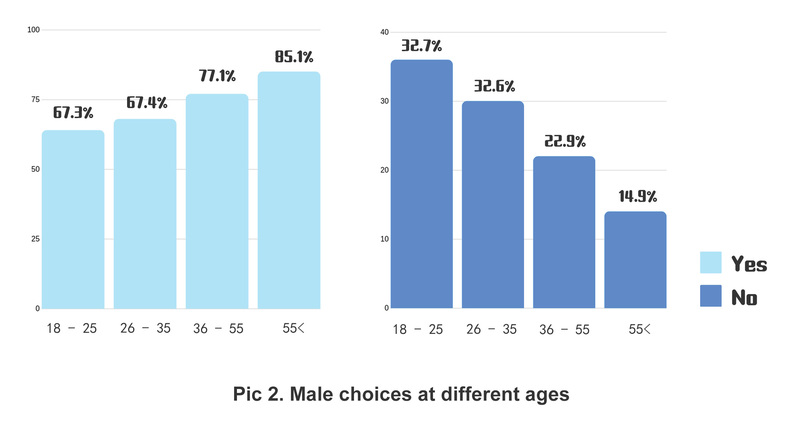 However, among men and women who said they would, there were different trends across age groups. The survey showed that men have more emotional needs as they grow older. 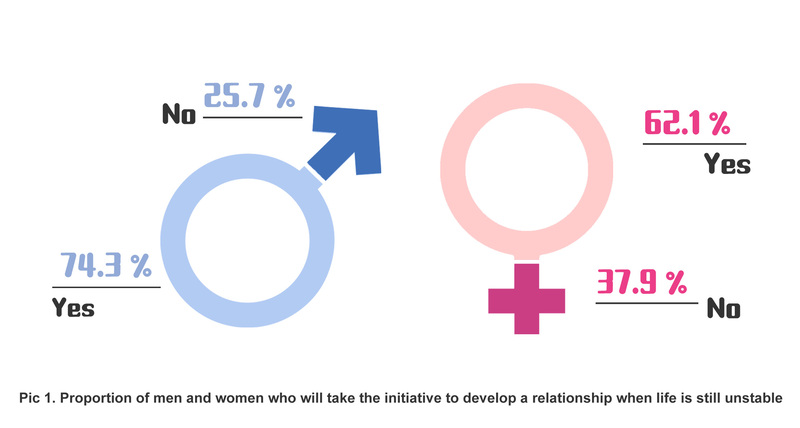 Among men aged 18-25, 67.3% chose to take the initiative to develop a relationship during uncertain times in their life. This proportion is 85.1% among men over 55. Women have high expectations for love when they are 18-25. 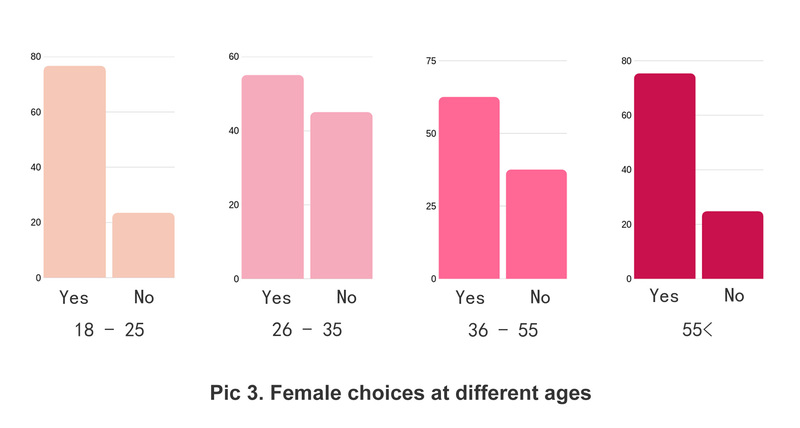 76.6% of them would take the initiative to commit to a relationship when they are facing uncertainty in life; however, by the age of 26-35, the proportion of women who chose “yes” drops to 55%. As women grow older, love once again becomes an important part of their lives. In addition to understanding our user’s intentions, we also have data on why they chose what they chose. 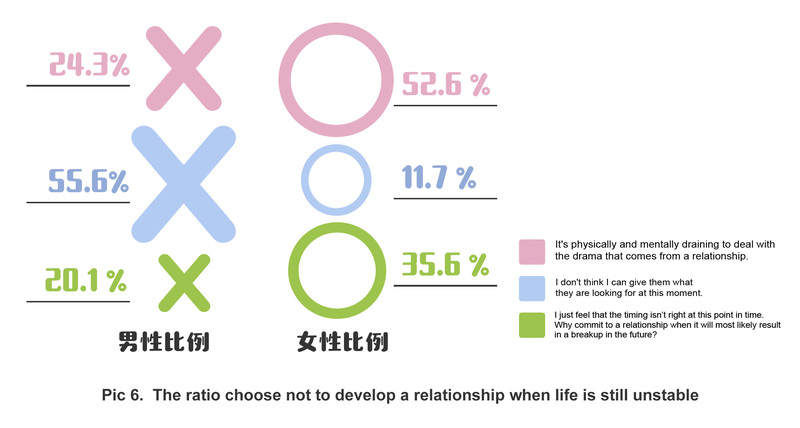 Regardless of gender and age, most of our users (53.8%) who chose “yes” are worried that “There is nothing more important than having a loving relationship. 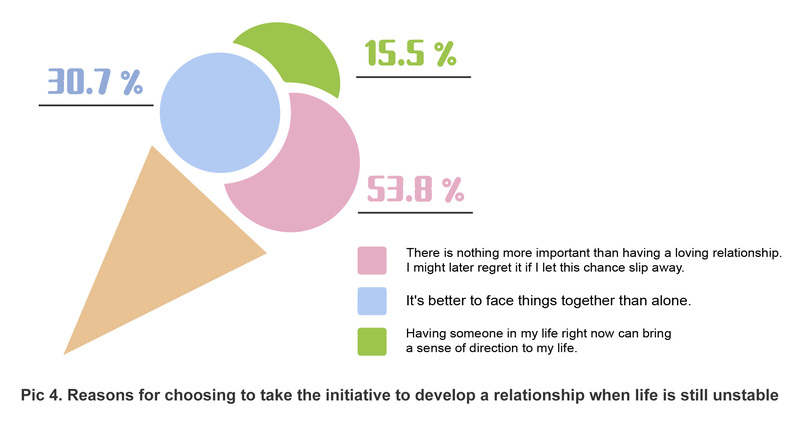 I might later regret it if I let this chance slip away.” Only 15.5% of users say “Having someone in my life right now can bring a sense of direction to my life.”. What’s more interesting is that among the users who say, “Having someone in my life right now can bring a sense of direction to my life”, both genders say it becomes more difficult to change for each other as they grow older. When we are young, we may still have the courage to change for love. As we grow older, it becomes more difficult to change ourselves for each other. Among those who chose not to develop a relationship when life is still unstable, we find that men and women think differently. 55.6% of men say, “I don’t think I can give them what they are looking for at this time” while 52.6% of women say, “It’s physically and mentally draining to deal with the drama that comes from a relationship”. It is also worth mentioning that 20.1% of men say “I just feel that the timing isn’t right at this point in time. Why commit to a relationship when it will most likely result in a breakup in the future?” 35.6% of women say the same which shows that women are relatively more sensitive in a relationship and are more afraid of being hurt. Those who would develop a relationship when life is unstable are romantics. They have the idea that it’s better to love than letting true love slip away and when happiness knocks, they should answer. Those who chose not to develop a relationship when life is still unstable are more cautious. They tend to be more calm and rational when coming across someone they could love. Different ideals lead to differences in approaching relationships. It’s these differences Different concepts will lead to different thinkings for feelings. It is the colorfulness of feelings that makes countless people yearn for. What’s your opinion? Do you go for it or do you mull it over? Leave a comment and let us know. 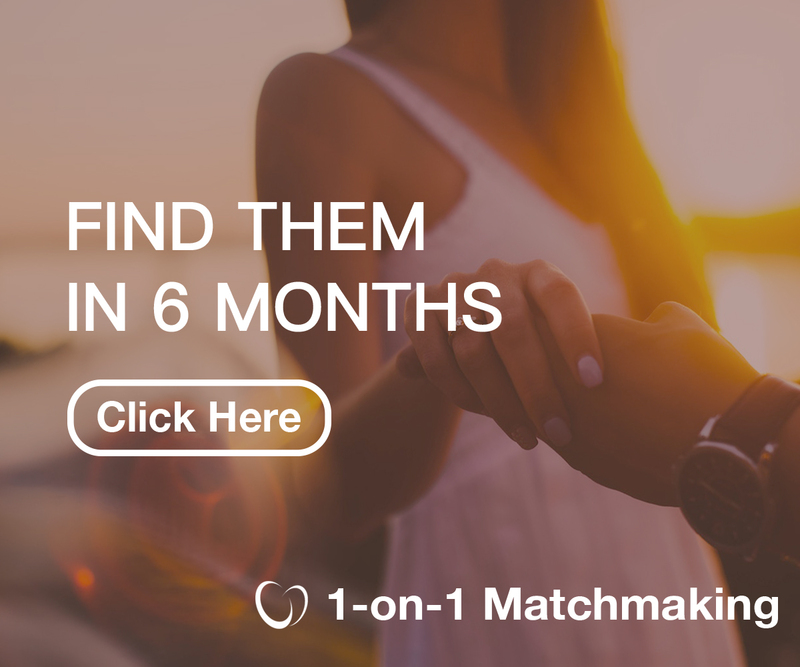 Also feel free to contact our matchmaker.